There isn’t anything as delicious as a warm, out-of-the-oven, homemade, chocolate chip cookie. 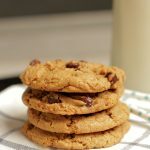 Those artificial-flavored cookies in the cookie aisle, even those “baked fresh daily” cookies, in your grocery store bakery, can not compare to this homemade version. I mean, can you even compare? Mix flour and salt. Set aside. In a separate bowl, combine Vinegar sucanat, brown sugar, egg, extra yolk, and butter. Let Soak overnight or at least 4 hours, in the fridge. Add second teaspoon of vanilla, baking soda and arrowroot. Mix until softened. Do not over beat. If using a kitchen Aid Mixer only allow to mix around bowl 3-4 times. This step will soften the dough. Over-working the dough will result in a tough cookie. Add chips and/or nuts. Scoop and bake at 325F for 10 minutes. Pull out of oven and allow to rest for 10 more minutes on cookie sheet. Using spatula scoop up cookies plate and enjoy.